One of the top reasons why you may want to extract the audio from video files is to add soundtracks and songs to your existing digital music library. You may also want to create MP3s from videos to save on storage space for use on portable devices. Even though many portable players (PMPs) these days can also handle the visuals, video files can be very large in comparison to audio-only files. Storage space can be quickly used up by syncing just a few videos and so if you just want to listen to the audio, then creating MP3 files is the best solution. One of the great features of VLC Media Player, which is seldom found in many software media players, is the ability to extract audio from video. VLC Media Player has good support for encoding to different audio formats like MP3 and you can convert from quite a wide selection of video formats; which includes: AVI, WMV, 3GP, DIVX, FLV, MOV, ASF, and many more. However, the interface in VLC Media Player doesn't make it that obvious where to begin or what to do in order to get the audio data out of your videos. 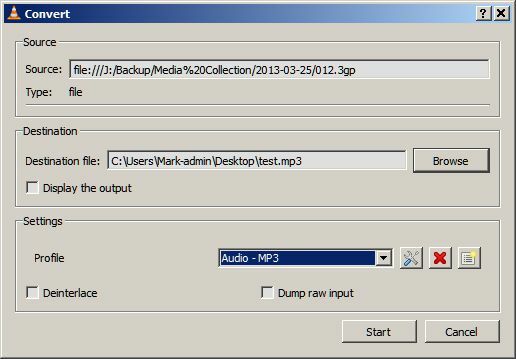 To help you quickly create audio files from videos, this article will guide you through the steps necessary to open a video file that is stored on your computer and then encode it to an MP3 file. This tutorial uses the Windows version of VLC Media Player, but you can still follow it if using the program on another operating system -- just remember keyboard shortcuts may differ slightly. If you want to convert a YouTube video to MP3, see our How to Convert YouTube to MP3 guide. Before you follow the simple steps below, make sure you have already installed VLC Media Player on your computer and that it is up-to-date. Click on the Media menu tab at the top of VLC Media Player's screen. From the list of options, choose Open (Advanced). Alternatively, you can achieve the same thing via the keyboard by holding down [CTRL] + [SHIFT] and then pressing O. You should now see the advanced file selection screen displayed in VLC Media Player. To select a video file to work on, click the Add... button. Navigate to where the video file is located on your computer or external storage device. Left-click the file to highlight it and then click the Open button. Click the down arrow next to the Play button (near the bottom of the Open Media screen) and choose the Convert option. You can also do this via the keyboard if you prefer by holding down the [Alt] key and pressing C.
Now that you've selected a video file to work on, the next screen gives you options for choosing an output file name, audio format, and encoding options. To keep this tutorial simple, we are going to choose the MP3 format with a bitrate of 256 Kbps. You can, of course, choose a different audio format if you need something more specific -- like a lossless format such as FLAC. To enter the name of the destination file, click the Browse button. Navigate to where you want the audio file to be saved and type in a name making sure it ends with the .MP3 file extension (song 1.mp3 for example). Click the Save button. In the Settings section, click the drop-down menu and choose the Audio-MP3 profile from the list. Click the Edit Profile icon (image of spanner and screwdriver) to tweak encoding settings. Click the Audio Codec tab and change the bitrate number from 128 to 256 (you can type this in via the keyboard). Click the Save button when done. Finally, when you are ready, click the Start button to extract the audio from your video to create an MP3 version.